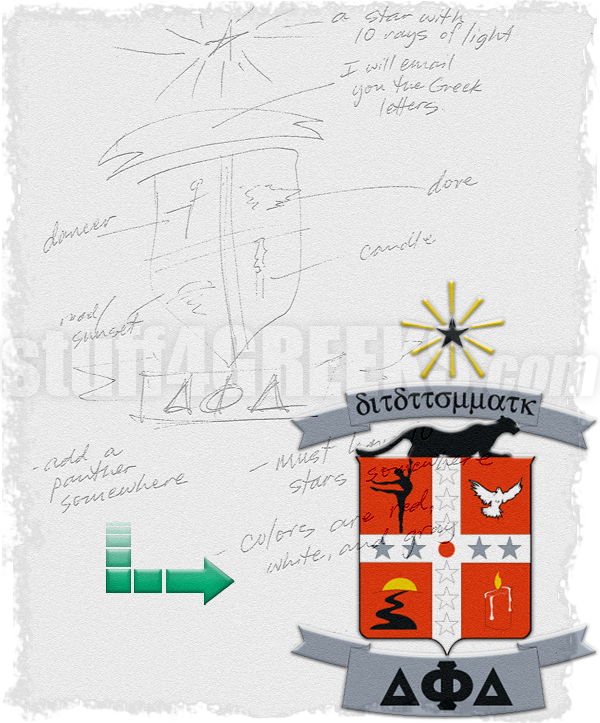 We'll design, digitize, and frame your custom emblem. What colors represent your organization? What wording or lettering must be included? Which symbols or icons are important to your group? Do you like any icons from our Design Library. Do you have any images or sketches that could help? Upload them. We'll design your emblem just the way you want it. Create any kind of insignia, be it a crest, shield, or logo for every type of organization (your chapter, business, sports team, group, family, etc). Just fill out this form to tell us what you want and complete the checkout process. When we get your order we will contact you if we have any further questions. We'll design a proof of your emblem and email it to you for approval. After all potential changes have been made, we'll digitize and embroider your emblem in a 16 inch x 20 inch frame. We won't stitch anything until we get your final approval on the design. If you ever want to have the same emblem embroidered on something else, we keep all artwork on file. Once we've digitized your emblem, you can easily bypass future digitizing fees for that design.